Our year-long Mystery Shopping project, funded by the Bromley Community Fund, has just come to an end. The project helped local disabled people to influence services, highlighting good practice and feeding back on how services could be more accessible. A trip to the cinema, shopping for new clothes, making an appointment to see your GP – we all have days when we seem to sail through life easily, and others when it all seems an uphill struggle. Our Mystery Shopping project demonstrated how important attitude is when services are being provided. Things may still go wrong, but a little willingness to put things right, to be flexible, to go the extra mile can all make the difference between a straightforward or enjoyable experience, and an experience that leaves you seething with frustration. 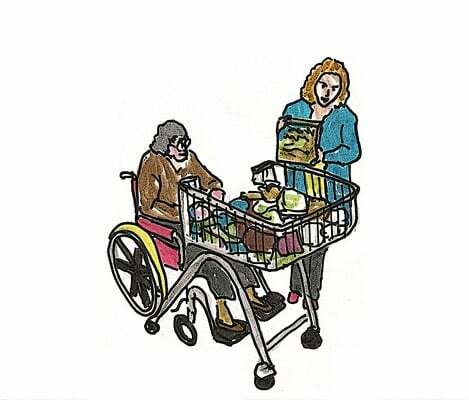 Our intrepid Consumer Champions tried out a range of services and thought about how their status as a disabled person affected the way the service was provided. Instead of just accepting that life is going to be difficult when you’re disabled, they expected to receive a service that was on par with the standard of service that non-disabled people would receive. The results were interesting, to say the least! The layout of a shop floor is something pretty easy to adapt, but our Champions found that different shops had a completely different approach to making life easy for people who have restricted mobility. For most people, a fun Saturday doesn’t involve an obstacle course, unless they’ve signed up for the challenge. A little bit of fore thought can make shopping a completely different experience. Public transport can be a challenge all of itself, so many disabled people need to rely on cabs now and again. Our Consumer fed back a sorry tale involving the loss of a part of their wheelchair, compounded by a refusal to take responsibility for it. Without the intervention of a passing transport police officer, who knows where the saga would have ended? Fancy a trip to a Museum? If you do, take care you don’t get trapped in the disabled toilet. Who knew they could be fitted with a heavy spring-loaded door closer, making it impossible to open from a wheelchair once you’re inside! And of course, how many disabled toilets are combined with baby changing facilities? Maybe you should go to the cinema instead. That seems like a safer option. It could also be boring and extremely frustrating if you’re Deaf or hearing impaired and need subtitles. Unless you want to see your favourite film at 9 pm on a Tuesday! We found that some cinemas are much better than others at providing subtitled performances. Tired of trekking miles when the local cinema doesn’t have the necessary, our Champion decided to take this up with the cinema chain involved. The initial response was they do try to put on subtitled performances but there aren’t many available. We took the matter further and received a more helpful response. What we learnt was that cinemas don’t have control over the weekly schedules of films. All they do is provide slots, which are booked up by film distributors. So the distributors are the go-to people if you want things to change. Watch this space – we have plans to take this further. Meanwhile, the advice we had was if you know a film you want to see is coming up, and you need subtitles, contact the cinema Guest services team and they will do their best to get the distributors to provide a subtitled screening. We’ll be testing this soon! Train travel is often a challenge for wheel chair users. The lack of staff means that people sometimes have to travel past their stop and get off further down the line, simply because that is where the staff are who can provide assistance. Imagine if this happened to everyone – there would be an outcry! We did get some good feedback, which gives us hope. If you fancy some fresh air in this unseasonal weather, Scadbury Park has disabled parking, plenty of benches and wooden walkways, although there are some steep areas approaching bends where you would be advised to watch your speed! Tesco Express staff in the Plaistow Lane store are commended on getting the right balance between being very helpful and pleasant without being overbearing about it. The local Clinical Commissioning Group responded very well to our Champion’s complaint about the difficulty of booking GP appointments, being willing to make adjustments to give equal access. We’ve produced a handy Access Guide of Do’s and Don’ts for service providers. You can access our online version here. If you would like a printed copy, let us know. Although the project has come to an end, we are still interested in hearing your experiences, good or bad. So get typing and email us at info@xbyxbromley.com with a brief summary of where you went and what happened. We’ll have a prize for the most bizarre experience! Coronation Street stars support the ‘Save the Independent Living Fund’ Postcard Campaign. Your VOTE counts – Elections on 22nd May 2014, 7:00am – 10:00pm Don’t miss out on your chance to vote!